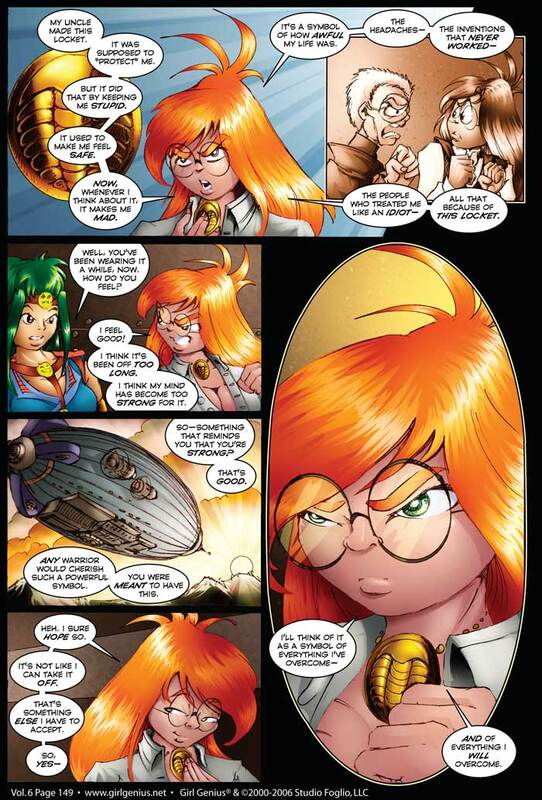 Girl Genius is written by Professors Phil & Kaja Foglio of TPU, with drawings by Prof. P. Foglio. Volume One was inked by Brian Snoddy. Volumes Two and Three were colored by Mark McNabb. Volume Four was colored by Laurie E. Smith. Cheyenne Wright is our current colorist. His work begins with Volume Five. Girl Genius is a registered trademark of Studio Foglio, LLC. Agatha Heterodyne, Transylvania Polygnostic and all Girl Genius art, characters, design elements and logos™ & ©2000-2017 Studio Foglio, LLC., All rights reserved. Airship Entertainment™ is an imprint of Studio Foglio LLC, and publishes Girl Genius Graphic Novels on a yearly basis. Look for them in your favorite bookstore! AutoKeen Lite programmed by Darren Bleuel, as a service of Keenspot Comics. Special thanks to RB "Sparks" who took it apart and made it work.